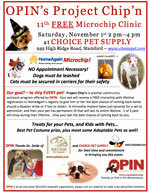 Treats for your Pets, and Kids with Pets... Best Pet Costume prize, plus meet some Adoptable Pets as well! Project Chip’n is another community outreach program offered by OPIN. Your pet will receive a FREE microchip with lifetime registration in HomeAgain’s registry to give him or her the best chance of coming back home should a disaster strike or if lost or stolen. A microchip implant takes just seconds for a vet to administer, and then your pet has permanent ID that will last its entire lifetime. 1 of 3 pets will stray during their lifetime... Give your pet the best chance of coming back to you.